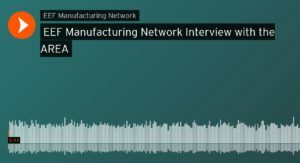 Mark Sage, Executive Director of the AREA explains in this EEF Manufacturing Network podcast what Augmented Reality is, the barriers to adoption and the RoI calculator which can help SMEs make decisions as to whether AR is right for their business. If you have any questions about augmented reality or the AREA then just send @Mark Sage a message via the Network. Mark Sage, Executive Director of The AREA, hosts this podcast highlighting the latest advancements in AR for the enterprise by AREA members at AWE Europe 2017 (recorded October, 2017). Featured speakers include: Christine Perey – PEREY Research & consulting; Carl Byers – Chief Strategy Officer, Contextere; Juergen Lumera – Global Augmented Reality Product Management Director, Bosch Automotive Services Solutions. In this podcast, Alex Gibson of 103.2 Dublin City fm reports from AWE Europe held in Munich, Germany on 19 & 20 October 2017. This is Europe’s largest gathering of Augmented and Virtual Reality professionals and among those interviewed are Mark Sage from The AREA (Augmented Reality for Enterprise Alliance) [at 15:35 into the show] and Ryan Pamplin, VP Evangalist from MetaVision who were showcasing their Meta 2 glasses.